Well, it seems I have somehow missed the window for blogging about the National Book Awards longlist… and judging by how long it takes me to churn out a fully-formed post these days, I’m criss-crossing my fingers that by the time you darling readers see this post, I won’t have missed the window for talking about the freaking shortlist. Gah!! 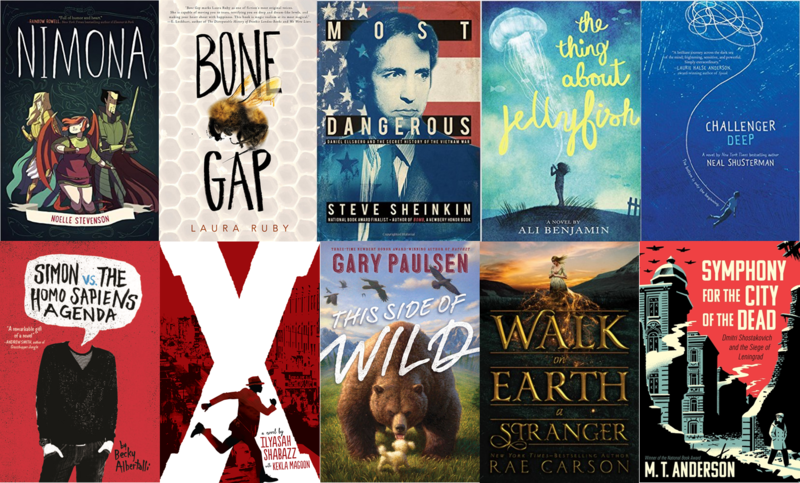 The ten finalists in the category of Young People’s Literature struck me as quite the… surprising bunch. Individually, I wasn’t surprised to see any particular title on the list, but together they just seemed a bit of motley crew. Two middle grade titles, one fiction and one memoir. Two nonfiction titles for older readers. A spread of YA – one realistic, one historical, and three on the spectrum of fantasy. Oh, and a non-realistic graphic novel to round out the bunch. That’s quite the spread. Since some of these books fell under my 2014-2015 Read All the Books jurisdiction, I have read an impressive five titles this year! Most recently – Simon vs. The Homo Sapiens Agenda and Nimona. Both of these I found kind of… left field-ish? I don’t know. While you see YA realism on the NBA lists occasionally, light romantic/comedic YA realism? Not so much. As I mentioned last month, I thought Simon was enjoyable, but perhaps a bit thin; not surprised to see it fall off the long-list. I read Nimona earlier this week as part of a Graphic Novel Extravaganza – loved the medieval/superhero mash-up setting, loved Lord Ballister Blackheart as a character and loved Goldenloin as the best character name ever. Very fun and very comic-y, which again, you don’t see very often on awards lists… and maybe I’m used to considering meatier GNs, then, because I left Nimona feeling like she was a bit light on theme, maybe? Also, am I just the oldest person around or were that the world’s TINIEST dialogue text? Alright. Curmudgeon out. Two I read in early 2015: Bone Gap and X: A Novel. Bone Gap: a genre-bending YA story that reads like a fairytale with a really endearingly misunderstood protagonist and a creepy-as-hell rural setting. X: a novelization of Malcolm X’s late teen years in Boston and NYC that focuses on how his experiences (and morally questionable teen-aged behaviors) led him on a path to self-discovery and activism. Both satisfying reads, but for my tastes, kind of middle of the road? Since X has already dropped off, we’ll see if Bone Gap can go the distance. Of the titles I haven’t yet read, two are already out of the running: Gary Paulsen’s This Side of Wild and Rae Carson’s Walk on Earth a Stranger. I almost ordered This Side of Wild for the library as fiction rather than biography a few weeks back, which is… embarrassing. Walk on Earth a Stranger sounds like a fantasy book that I could dig, but I’m heard such conflicting reviews from respectable sources: some dug it hard, some found it completely culturally insensitive/offensive. Argh. Either way, neither are in the running, so the stakes for reading are lower. And speaking of books that are no longer in the running, can we pause and shed a tear for M. T. Anderson’s Symphony for the City of the Dead? I haven’t yet read it (despite my better intentions), but I’ve heard that it’s good-good-good-good and I just really can’t imagine that this awards committee came to that decision easily. I HOPE YOU ARE ALL LOSING SLEEP, COMMITTEE. Juuuust kidding. That was pretty hoe-stile. And I haven’t even read two of the final contenders, so even if I had read Symphony, I would still have a useless opinion. First, we have Steve Sheinkin’s Most Dangerous: Daniel Ellsberg and the Secret History of the Vietnam War; Mr. Sheinkin’s name is never a surprise to an awards list. He’s simply doing some of the coolest stuff with narrative nonfic right now. Also, I’ve heard him speak before and he seems like… the absolute nicest, nerdiest dude you will ever meet. Next, our MG offering, Ali Benjamin’s The Thing About Jellyfish. And it’s a debut! How exciting! I had heard zero about this book before seeing it on this list (we even missed it for ordering at the old librario), but it does look like the kind of tween-y MG that I would like. Guys. This book. It certainly has a sentimental corner of my heart, but my own sappy personal BS aside… THIS BOOK. I read it in May. I was reading a book a day at that point – it was the 110th full-length book I’d read in 2015 alone. And just a few chapters in, I was perplexed, I was riveted, my jaw just dropped to the dang floor. So yeah, this one is my favorite.